When it comes to building your own home, don’t be like everybody else. Ever walked past the same house in the same street? Your home should be personalised and tailored to your needs, don’t buy a rubber stamp home with a cookie cutter floor plan. JPM are custom home builders who will design and build YOUR dream home, for YOU only. During the initial consultation, we take great care to listen to your ideas and expectations to ensure your home is the perfect fit for you and your family. From the exterior facade through to the interior floor plan and finishing - we guarantee your home will stand out from the rest. Build a home that tells your story, one which your personality and vision can show through. Define your inspirations and watch your dream home come to life. With JPM, your custom build home is like a blank canvas that allows you to be as creative as you wish. After all, it IS your dream home. So, go ahead and express yourself! However, we also appreciate that for some clients it can be a little daunting when it comes to colour selections and styling, so if you need any help we can introduce you to various design specialists to ensure you achieve the look and finish that best matches your lifestyle and budget. 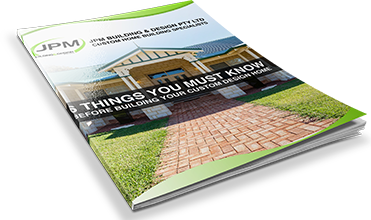 JPM Building & Design recognises that choosing to build a Custom Home can be one of the biggest decisions you will ever make, however we assure you it is a rewarding and affordable option. We’re happy to work with your plans or if you are starting from scratch we can help custom design and build your dream home, taking care of every detail from conception to completion. Your Ideas - Your Vision – Your Home! It is our priority to deliver a superior Custom-Built Home while making the experience simple and enjoyable. Our team is committed to excellent customer service and prompt communication throughout the project and offer flexibility when it comes to accommodating any changes you may require during construction. When you place your trust in us to build your Dream Home, the best way we can thank you is by giving you a unique building experience that keeps you informed every step of the construction process. You can be confident you are in the right hands with JPM Building & Design - the custom home building specialists. We will tailor your new home perfectly to reflect your vision and suit your needs. Building our house with JPM Building & Design made what is supposed to be a stressful time quite the opposite. It was the first time we had built and Johnny just made everything "happen”. I trust Johnny completely and am looking forward to the time that I can build with him again. We would definitely recommend Johnny and JPM Building & Design to anyone who is after a quality builder. Our house is everything we hoped it would be and we are extremely happy with the results. Johnny’s experience, commendable workmanship and vision enable us to have everything we dreamed of. I have recently moved into my new home and am absolutely thrilled with the attention to detail of our finished product. Johnny was extremely attentive to all of our requests and promptly offered suggestions to minimise additional costs. Thank you JPM Building & Design you not only built a house, you built my home. Here at JPM Building we pride ourselves in building quality custom built homes, home additions, home extensions and knockdown rebuild. Browse through our gallery of completed projects, which gives you an insight into the innovative designs and home features we offer clients.